Android powers hundreds of millions of mobile devices. It is the largest mobile platform which is growing rapidly all around the world. Everyday thousands of users power up their Android devices and start looking for amazing apps and games. But what if you don’t have any Android device but you want to run the same apps? Here is the solution for your problem. Using this app you can run android apps in chrome. If you have a Chrome browser installed on your PC then you can have fun with all your favorite Android apps. Though, there are many ways to run Android apps on PCs but here you can follow the easiest way to run Android apps in Chrome browser. In order to run the desired app on Chrome, you need to get the APK file of that app. There are two methods to get APK file of your desired app. One is that you download APK files from any website that offers you those and the other way is to download APK files from Google play store using a client. You cannot download apps directly from Google Play Store. The collection of apps differs from website to website. You can get the APK files from many websites depends on the availability of that app. You can download APK files of your required apps from any of the following websites. If you want to download the APK file from Google Play Store, then you have to visit another website to complete the process. First, go to Google Play Store. Search for your required app and then go to that page. Now copy the URL link of the page. Now, second step is to visit APK downloader website where you will see an input field. Paste the copied link in that field. Now you just have to click on “Generate Download Link” button. It will generate downloadable APK file link. Now, all you have to do is click on it to download the APK file. 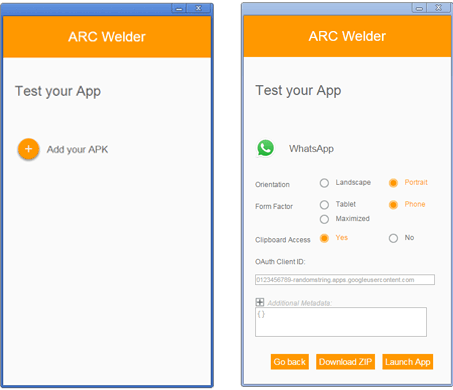 ARC Welder is a Chrome Extension that allows users to run Android mobile apps through the Chrome browser on any operating system on Windows PC. Some apps do not work on ARC Welder while others work. Go to Google Web Store. Once installed, you can see an icon “Apps” in “Bookmarks bar”. Click on “Apps” or type a chrome://apps/ in address bar and hit enter. A new window with different icons will open. 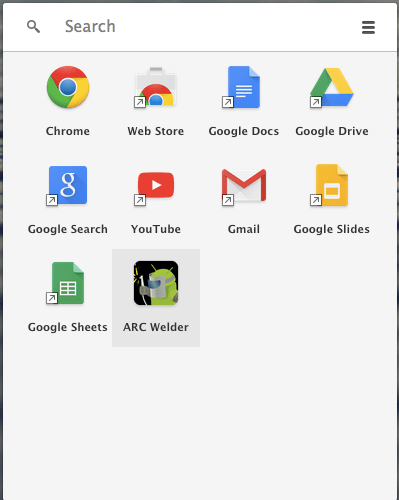 Here you can see an icon of ARC Welder on App’s page. To launch ARC Welder, click on that icon. A prompt window will be opened with a “Choose” button. 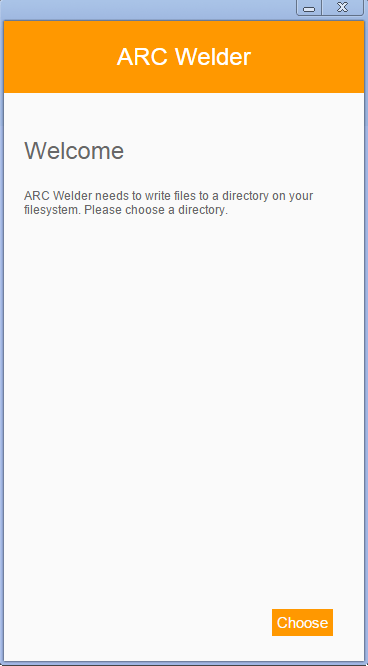 By clicking on “Choose” you can select the directory where ARC Welder will write files. After choosing a directory, click on “Add your APK”. A new window will open. Now, navigate to the location where you downloaded the APK file. Open the APK file. A prompt window will be opened to configure display settings. You can configure display settings before launching the app. When you are done with display settings, just click on “Launch App” button. Android allows you to run multiple apps at a time but you are not allowed to do it here. If you want to add another app then you must close the launched app. Otherwise ARC Welder will close the first app to launch the new app. Note: Chrome does not support all Android apps. There might be some compatibility issues. If Chrome does not support the app which you are trying to run, either the app will not work properly or will not work at all. These simple steps will help you run Android apps in Chrome browser. If you are facing any problem while following these steps, then let us know in the comments below.